The Ute Trail stretches for over 50 miles from Dotsero, near the confluence of the Colorado and Eagle Rivers, over the Flat Tops, to the White River. Anytime 'Ute Trail' is mentioned a person needs to study the context to figure out which of the dozens of trails by that name is being referred to. The Utes called these mountains home for hundreds of years. Many of the trails that they used were also used by their ancestors. Winters were spent in the lower valleys around the 5000 foot elevation. As the snow would melt in the spring the Utes would move further up following trails like this to the places where they could hunt and gather plants and herbs. 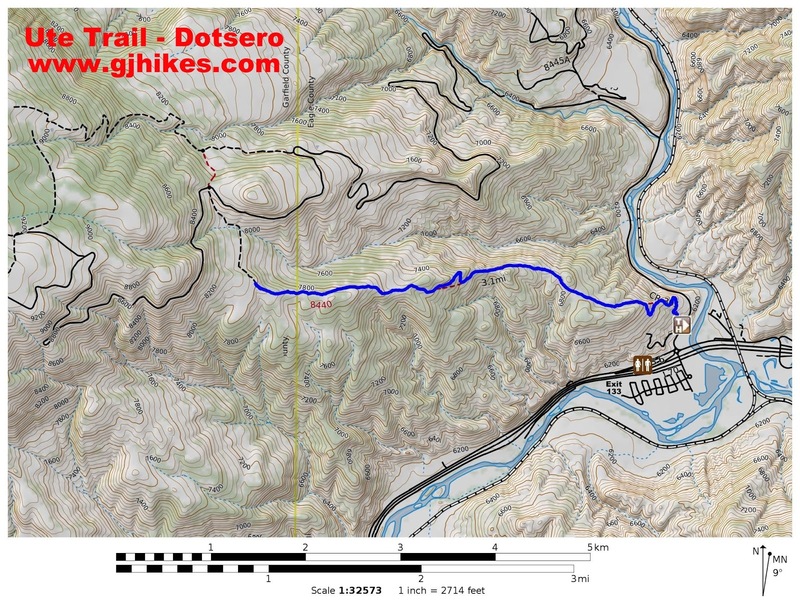 This post follows the first section of this particular Ute Trail from Dotsero to near its junction with the Coffee Pot Road. The trailhead is located off of CO 301 within a quarter mile of its junction with Interstate 70. 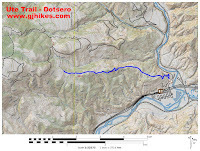 To get there take Interstate 70 to the Dotsero Exit 133 and head north on CO 301. There are no restrooms available at the trailhead but there are some at the truck parking area near the interstate. The trail begins with a steep climb up the side of the mountain. Several switchbacks lessen the impact for both hikers and mountain bikers. The slope of the ascent lessens occasionally and after reaching the top of the first hump it levels off even more. No sooner than you get over the first hump the second one begins. There are about 4 of these humps, or rounded hilltops, to climb between the trailhead and Coffee Pot Road. Coffee Pot Road can be seen climbing a different ridge further to the north. As the trail gains altitude the junipers give way to pinions that in time give way to gamble oaks. When we left the trailhead the sun was coming up and the sky was clear. Within about a quarter mile of the Coffee Pot Road a storm had rolled in over the mountains with thunder and lightening accompanying it. With rain beginning to fall the open terrain of the homestretch seemed much to exposed so we cut the hike short and headed back down the mountain. From the trailhead the mountains around Dotsero look tall and formidable but at this point on the Ute Trail a person can see over the top of them where more distant peaks make up the skyline. One part of the trail sparkles in the sunlight with specimens of gypsum showing through the dirt. For the locals the Ute Trail is a good place to hike and get some exercise. 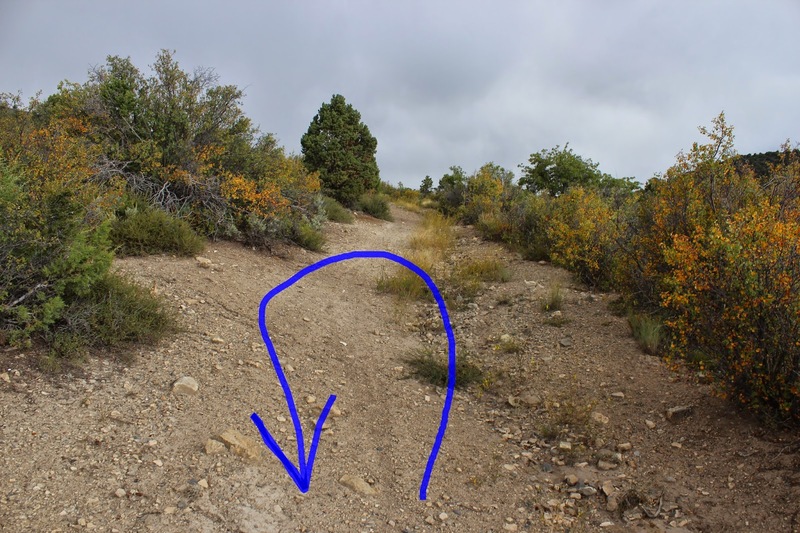 A popular mountain bike route is to park at the trailhead and ride up CO 301 to the Coffee Pot Road and follow that to the point where the Ute Trail crosses it and then roll downhill on the Ute Trail to the trailhead. The whole loop is around 14 miles. Knowing a little bit of the history of the Utes makes hiking the trail a whole different experience. We recommend the book 'The Last War Trail' by Robert Emmett to get an understanding of some of their views on life and their relationship with the land. As far as this section of the trail goes, if you would like to see it for yourself then all you have to do is 'Take a hike'.